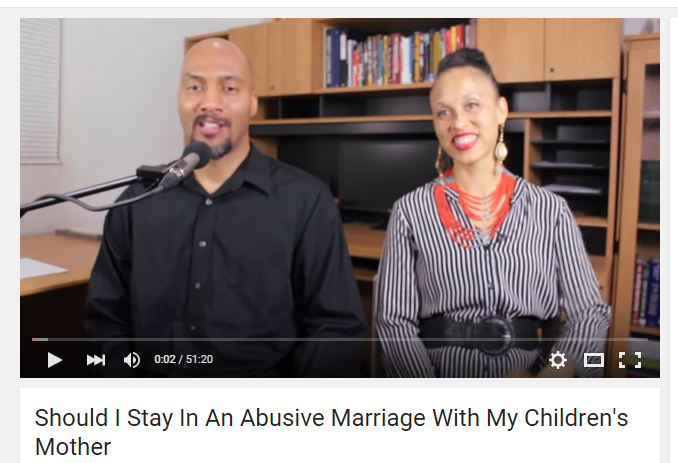 Ask Nana: "Should I Stay In An Abusive Marriage With My Children’s Mother"
NB Commentary: Great video and great advice. Kudos to Lenon Honor and his wife, Aida. I can confer as a Mental Health Professional for many years and also from my own experience. One thing that is missing in this presentation is the focus on the female in this relationship. Why is she so angry? Of course he obviously does not know or cannot see what it is that has made her so angry, but it could be a number of things. She may have come from a very angry household and he may have come from an abusive household which we all know, one sickness feeds the other. But even on a deeper level, how many people take the time to notice what childbirth does to the female, mentally, emotionally, spiritually and physically? It seems from what has been mentioned here that she has had a succession of childbirths, one after the other. Why? Religion? Family pressures? Economics? What and why did she have 4 children in such a short time span? Could she possibly be overwhelmed with the amount of work that it took and continues to take to care for the everyday needs of her children? How much help does he offer to make this a lighter burden? Are they able to get assistance from family/friends or maybe a nanny from time to time? What I am pointing to is all too often people jump into marriages and have children when they were not prepared for marriage what it means to be a marriage partner and much less prepared for the day to day routine of childrearing and I mean healthy creative childrearing where two partners, family and even friends agree. How often do we find ourselves isolated due to the questions around how we are rearing our children? How often do family, friends, co-workers, and even associates question and judge the way we rear our children? What if there is a chasm in the way these two individuals parent within the household. Women need to take more control over their lives and their bodies. Being a baby machine does not offer the comfort, security, peace and support that is portrayed by the high rollers and celebrities. Without support from a caring and nurturing family, friends etc. a woman can feel so isolated and alone. She may even be angry with and at her situation that she has all these children and little support. Women need to take time to get to know what their strengths and weaknesses are before they even get married, as well as know what a healthy relationship looks like and what healthy creative parenting looks like. There are so many nuances to this story and the man who wrote this letter to you sounds like a classic victim. But victims are often passive aggressive and that is how they fight back when they are feeling victimized and/or dominated by the other person in the relationship. Again, I have to go back to how pregnancy changes a woman in every way, and each pregnancy brings new and sometimes strange changes. She never goes back to being her old self, or the self she knew before she had the children. She may lose weight or even fit back into her clothing, but really and truly, she changes. So the question of “what changed” may be that “she changed” and that she changed more and more after each pregnancy. If she did not have the mental, spiritual, emotional and physical support to help her understand her changes then it is most probably that she wrap that “neglect” into anger and began to do what she knew how and that was lash out. She sounds like she is very, very angry. She is angry with her own life. She may have been living a lie for far too long. She wants out but then what? What man is going to marry her with 4 children? She may feel so lost, isolated, devastated, out of control, out of touch with her reality, deeply saddened and hurt that she is in her predicament, that all she can do is lash out to gain some control over her situation. This sounds like a very convoluted situation with more nuances than I am sure, this young man can address or even fathom. It is a long unaddressed situation that has spiraled to the point where no one is hearing anyone, everyone is desperate, needy, hurt, overwhelmed and out of alignment on so many levels. With that being said, saving the marriage may be the least of their worries, saving their individual beigness may be an even bigger challenge, but one that needs to be addressed so that they can move forward as healthy human beings. Because like second hand smoke can be just as deadly, so can second hand toxicity stemming from past unresolved relationships can lead to a string of hurtful, unhealthy relationships for both in the future. GET INDIVIDUAL COUNSELING BEFORE YOU DO ANYTHING!